Thoughtful hotel design can provide a sense of local connection for guests. One of the most pleasing parts of traveling is discovering new cultures through art, food, music, and more. Hotels can provide their guests with a connection to their city by utilizing design elements that bring local culture directly into their design. This sense of place can be integrated into a hotel’s overall aesthetic, with elegant design and features that engage all the senses. Correctly executed, your guests will be immersed in the destination via color, sound, and décor from the moment they arrive. Picture this: you’ve just gotten off a long flight and rushed over to your hotel. It’s late, you’re tired, and you just want to check-in and get some sleep. Your mind is foggy from jet lag and spinning with details of the presentation you have to make tomorrow and you feel a pounding headache coming on. You aren’t expecting much from your hotel – maybe a hot shower and a good soft pillow. But, as you approach the check-in desk, you’re struck by an enormous art installation in the lobby. Even though you’re tired, you’re arrested by its structure and contemporary design. As you’re being checked in, you notice the placard under the piece – it indicates that it was created by a local artist. You get checked-in and head to your room. Along the way, you’re greeted by more local accents – a bench built from wood reclaimed from a historic downtown building. A delicious smell wafting from the restaurant that conjures fond memories. When your head finally hits the pillow, you’ve lost track of your mental checklist and fatigue. Instead, you make a mental note to use your free time on this trip to explore the city. You’d like to see if that artist is featured in the local museum, or maybe you’ve decided you absolutely must sample some of the local cuisines. This is the power of intentional design. You can bring your guests a sense of centeredness and curiosity by using your space to introduce them to your city’s unique aesthetic and history. Here are three great examples of properties around the world that have used design to bring their guests closer to local culture. Located in downtown Seattle, Motif made waves in the industry when it unveiled a $10 million redesign in 2017. The makeover included details from Seattle’s thriving arts scene, with bold artwork in guestrooms and wood sourced from the Pacific Northwest. Each guestroom features a custom piece of visual art commissioned from Seattle artists. Motif has incorporated its commitment to supporting Seattle’s local art scene into its branding by selecting a visiting artist each year to design a signature decorative pattern or design that is used on the hotel’s branding items – such as stationary, key cards, and merchandise. Known as one of the great cities of the ancient world, Xi’an, China, has a long and storied past. It was the key entrance point along the Silk Road – an ancient transcontinental trade route that connected the otherwise isolated cultures of the East with those of the West. This history is at the forefront of the Grand Hyatt Xi’an’s design approach. Despite its emphasis on local heritage, the hotel is anything but traditional. Impressive modern architecture and sculpture are blended with its historic accents to immerse visitors in a unique experience. The reception lobby, for instance, is cocooned in a softly undulating white wall reminiscent of the inside of a tent and drapes being blown by the wind. The elevators are enveloped in metal screens that depict Chinese palaces of old. The staterooms feature modern colors, custom furniture and artwork depicting traditional Chinese cityscapes. Travel + Leisure named this “The Coolest New Hotel in San Francisco” when it opened in early 2018. 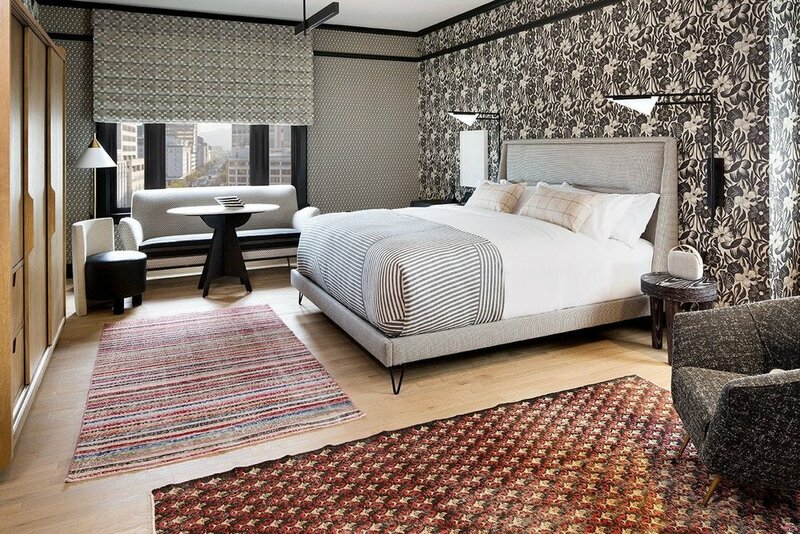 The hotel’s 131 rooms blend wallpaper prints reminiscent of the early 20th century with throw rugs, Vifa speakers, Aireloom mattresses and custom case goods sourced by Beachwood Custom to create a beguiling retro vibe in an iconic and historic flatiron building. Six room layouts are available, including bunk rooms furbished with ribbed walnut bunk beds with brass ladders and encased basins stocked with Aesop bath and beauty products. Each room is equipped with a tablet computer guests can use to stream music to the Vifa Bluetooth speakers or Proper Concierge, and a 50-inch smart TVs provide access Netflix, and more than 1000 other apps via Google Chromecast. These magnificent hotels illustrate why the team at Beachwood Custom loves working with boutique and premium hotels from around the globe. To learn how we can source customer furniture that will make your property unique, why not contact Beachwood Custom today!